This weekend is National Scrapbooking Day - well I for one think it needs renaming - International Scrapbooking Day. So I thought what I would do is make some labels (not JUST leather LOL - I am awaiting on a tech problem at Atomic Cupcake so I can get some more lovely actions to play with) celebrating the international flavour of the digital scrapbooking community. So these were just the initial ones I have done this morning - yeah finished the tax stuff for both businesses and gave myself some scrap time as a reward. 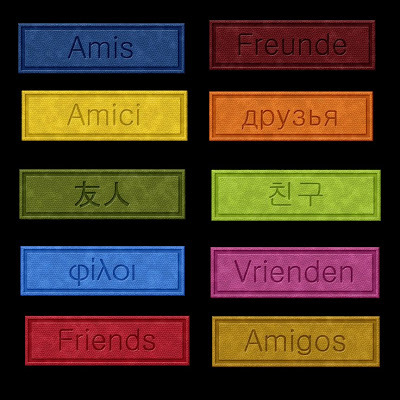 So here's the deal - I could only get a handful of translations for the word friend. If you would like to leave me a message in the comments to this post with the word friends in your language I will do those as well and post the results on Sunday. For my fellow Aussies - I will be including the word "mates" - LOL. I plan on doing these in as many mediums as time allows (there goes the housework !) and since EVERYONE love Pam's Jump Kit - I will use those colours. Thanx for so many wonderful freebies! I love your site.. The Afrikaans for friends is "vriende" - jip, I live in good old South Africa. Thank you so much for sharing all your freebies with us. I hope you're able to use this word. This looks like it will be a great set. As an American I can't think of any special friend words. But I can see the potential for school pages when we study countries. And my oldest's travels as well. Thank you Erika, this is realy great to see a dutch scrapping word come by. It's so welcome! Hope to see more of them. I forgot to mention: in dutch they also call it 'maatjes' I think the translation in english is 'mates' or 'best buddies'. Also 'buddies' is used here. The female form in dutch is 'vriendinnen' and for kids the small form (?) 'vriendjes' (male)& 'vriendinnetjes' (female). I hope you will use some of these. It's great you want to do these in different languages. Hmm I can't find a download link - can someone help me? This is wonderful! I love having friends from other countries through our common interest in digiscrapping. I hope you will add a download link. The preview is just to give people the idea and check the spelling of the languages I have got to date. If you read the post you will see that I asked if people can give me their translations for Friday and I will post the tags on Saturday/Sunday. Sorry if that was not made clear.